The Fellowship was fortunate enough to obtain a copy of STAR TREK COUNTDOWN TO DARKNESS #1 from IDW Publishing. The story is by Roberto Orci and Mike Johnson, written by Mike Johnson, art by David Messina, ink assist by Marina Castelvetro, colors by Claudia Scarletgothica and letters by Chris Mowry. The Enterprise has arrived at Phaedus for a scientific study of the planet. It’s the first time a Starfleet vessel has been here in five years. Kirk, Spock (both sleep deprived for different reasons), Mr. Sulu, and Mr. Hendorff must take a shuttle to the planet to discover why a high-frequency energy field is coming from the planet and messing up communications and transporters. The shuttle crash lands due to weapons fire (technology the natives should NOT have). While Mr. Hendorff tends to Sulu’s injuries, Kirk and Spock take off to find out what exactly is going on here. They soon encounter the planet’s natives…and someone else. This is the prelude to this summer’s STAR TREK INTO DARKNESS film. I have enjoyed the regular series and was pleased to find out that the same creative team is behind this bridge from the comic to the next movie. The evidence is clearly here in this issue with references to both the book and previous film. The only downer is there isn’t a Tim Bradstreet cover (minor I know). The surprise at the end of this issue has me really curious on how the story line will go. 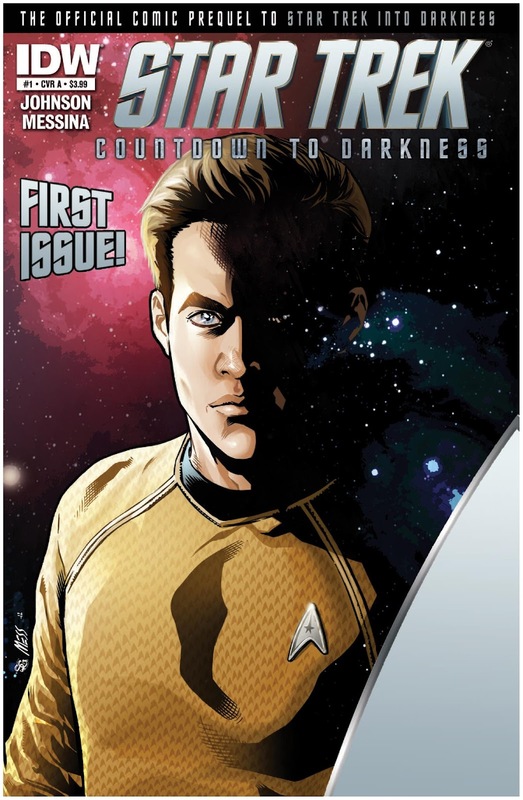 STAR TREK COUNTDOWN TO DARKNESS #1 is in stores now and available at www.idwpublishing.com.